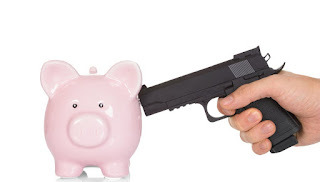 Some years ago, when I suspected there would be a War on Cash at some point, everything in the behaviour of the central banks pointed to the idea – it fit exactly into their own informed, yet unrealistic pattern of logic. I therefore decided that it would be a likely development and would take place at a time when they had tried everything else and had run out of other ideas. As to a date when this might happen … I had no idea. When several countries had begun to limit the amount of money that a depositor could take out of a bank, I decided that the first shots in the War on Cash had been fired and began to publish my prognostications as to what shape it would take. First, there were the benefits to the bank (the elimination of cash transactions, which would assure that virtually all monetary transactions, large and small, would have to be passed through banks, allowing them to effectively “own” all deposits, charge for every transaction and even refuse transactions.) The governments would also benefit. In approving the banks’ monopoly on monetary transactions, they’d benefit primarily through the new ability to tax people by direct debit, ending any remnant of voluntary payment of taxation. This indicated to me that the central banks had decided that they’d already waited too late and had better hurry up the programme to assure that it was in place before a currency crisis could heat up. Since then, someone came up with an excellent name for the phenomenon, “the War on Cash,” one that succinctly describes the plan in a nefarious way, as it deserves to be described. Today, anyone who is paying attention is aware of the War on Cash and what it might do to him. As each new salvo by the banks and governments is uncovered, attentive observers are publishing such developments on the internet. So, let’s have a look. First off, we know that whenever there’s a coming monetary collapse, major banks look forward to employing their political influence to assure that legislation and emergency government measures protect them in such a way as to assure that the upcoming competitors are put out of business. We can expect the same this time around. These smaller banks arise during boom times by creating many small branches – the type seen in strip-malls and shopping villages. Typically, they may have only 1000 or more depositors per bank – just barely enough to create profit, but, as “convenience banks,” they can count on a steady business from those who live nearby. Larger banks also tend to create numerous branches during good times, in order to hold down the rising competition; however, they resent the need to create endless less-profitable entities that tie up funds that could otherwise go out as directors’ bonuses. Consequently, when a monetary crisis occurs and the government steps in to help out the major banks, many of the competitors are driven under, as they don’t receive the same governmental support. At such a time, we see the edifices in the city remain, whilst the little banks in the strip mall disappear. The majors can now be rid of them. During a banking crisis, a country returns to 19 th century banking in terms of available institutions. Want to make a deposit? Make a trip into the city. In keeping with the War on Cash, ATM’s will also be eliminated. All transactions will be by plastic card or smart phone. Certainly, as a result of the dangerous position the banks will already be in, we shall witness a steady increase in the charges by banks for the privilege of having the bank control depositors’ economic worth. Worse, we shall witness the outright confiscation of deposits (as in Cyprus in 2013) and the control of how much a depositor may debit his account in any given week (as in Greece today). It’s at this point that a universal trend will unquestionably take place to get around the banks’ control. This, I believe, will manifest itself in two ways: Top Down and Bottom Up. Countries such as Romania and Mexico will serve as an early-warning system. The solutions they and other “fringe” countries employ will spread quickly to the larger world. In order to keep from being controlled by banks, the average person in the EU, US and other “civilised” jurisdictions will learn quickly that, if other forms of trade (alternate currencies, precious metals, barter, etc.) allow him to feed his children when the banks restrict him, he’ll resort to any and all forms of black market dealing that he can find. Following World War I, the victors decided to economically cripple the losers – Germany. The Treaty of Versailles was ruthless in its purpose – to strip Germany of all possibility of future prosperity so that it could never rise again. Of course, what happened was the opposite. Following an economic collapse just five years after the war, the German people, now desperate, chose to follow a new leader who promised that he would “make Germany great again.” The more arrogant he became, the more support he received. The oppression of the Treaty failed, as Germans, pushed to the wall, came out fighting. I believe that the War on Cash will end without such an extreme, but, just as the Treaty of Versailles, will be stopped by the people of the world as a result of a monetary stricture that is simply too oppressive to be tolerated. This will by no means be a pleasant historical period to travel through. Many people will have their savings wiped out. Many will literally starve. But the anger that’s created in them will reveal the banks as the clear “enemy” in this drama and, those citizens who are presently respectful of the laws of their country, will increasingly defy the enemy. They will resort to an alternate system. This is historically what has always occurred when people have been squeezed to this degree and it will repeat itself this time around..
About the Author: Jeff Thomas is British and resides in the Caribbean. The son of an economist and historian, he learned early to be distrustful of governments as a general principle. Although he spent his career creating and developing businesses, for eight years, he penned a weekly newspaper column on the theme of limiting government. He began his study of economics around 1990, learning initially from Sir John Templeton, then Harry Schulz and Doug Casey and later others of an Austrian persuasion. He is now a regular feature writer for Casey Research’s International Man and Strategic Wealth Preservation in the Cayman Islands.